The Willsie-Goodchild recital on Sunday was a wonderful mix of the traditional the new. Lucas Willsie, a doctoral student at the University of North Texas, performed the Ireland Fantasy Sonata with Luca Ferrini. The performance accentuated the juxtaposition of lyrical lines and passage work while uniting the sections of the work. 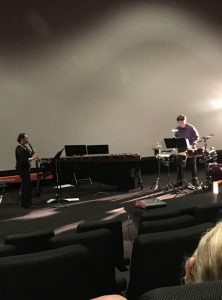 Goodchild presented two world premiere works for clarinet and percussion by female Canadian composers. Both works acted as a dialogue between the two instruments. Cat Fight by Kendra Harder was minimalist in style and utilized all registers of the clarinet well. Dialogues by Shelley Marwood presented a set of miniatures that portrayed interactions between the two instruments that might, as Goodchild said, “occur around the breakfast table.” Markedly more modern and almost esoteric, the work included bass clarinet double and a moment where the clarinetist, to represent her distraction and disinterest in the conversation, was instructed to take selfies as part of the performance. Overall the performance was a great experience, and I look forward to hearing Lucas Willsie and Melissa Goodchild again in the future.